Firaaq is an Urdu word that means both separation and quest. The story is set over a 24-hour period, one month after a carnage that took place in Gujarat, India in 2002. 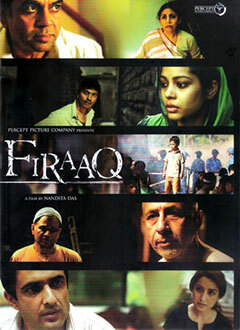 Firaaq is a work of fiction, based on a thousand true stories. It traces the emotional journeys of ordinary people – some who were victims, some perpetrators and some who chose to watch silently. It is an ensemble film that follows multiple narratives that are at times interconnected and at times discrete. What unites them is their spatial and emotional context. A middle class housewife closes the door on a victim and struggles to overcome her guilt. The loyalties of two best friends are tested in the times of fear and suspicion. A group of young men having suffered the violence seek revenge to fight their helplessness and anger. A modern day Hindu-Muslim couple struggle between the instinct to hide their identity and the desire to assert it. A boy desperately searches for his missing father, having lost the rest of his family in the riots. A saintly musician clings on to his idealism, despite all the violence in the city, until an incident shakes his faith. Through these characters we experience the consequences of violence that impact their inner and outer lives. Violence spares nobody. Yet in the midst of all this madness, some find it in their hearts to sing hopeful songs for better times.